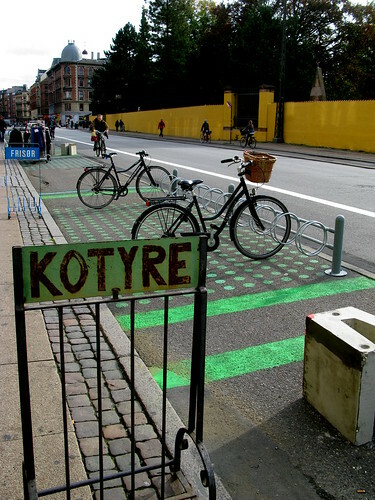 In the continuing tale of Nørrebrogade here in Copenhagen - the street that turned its back on cars - here's an example of reclaiming the streets. We've covered the bus zones and the loading zones. This is a Flexzone. You can see in the photo that the bike lane was reclaimed for bike racks here but elsewhere up and down the street it is to be used for tables and chairs for cafés or for shops to display their goods, etc. The bike lane is now on the street, where a car lane used to be. At the moment it is a painted lane, but when the trial period is over and the project is made permanent a proper bike lane will be put into place. It's nice to see a car-free street in the background.